Isaac is creative, entertaining, comical, inquisitive and just a delight to be around. He brings a smile to everyone's face he meets and continues to surprise everyone with his outgoing personality. Isaac was born in July 2006 and had many obstacles to overcome since birth such as a fractured skull, RSV, months of OT and severe allergies. Isaac's allergies have been the biggest obstacle for him since birth and range anywhere from soap, plants, medications all the way to foods. One of the several foods Isaac is allergic to is a simple peanut. As small as a peanut is it poses the biggest potential threat to his safety. Our family was fortunate to find this allergy through testing and has gone to great lengths to modify his environment in order to ensure his safety. Isaac has only had contact with peanuts on two occasions when someone had eaten a candy bar containing them a couple of hours prior to kissing him on the cheek. He had an immediate reaction. This reaction came from residue in saliva. Isaac's allergy skin testing has positively concluded his allergy to peanuts and has worsened over the past two years. Due to the potential for a severe reaction, it was recommended we avoid any and all contact with peanuts. Our son does not go to birthday parties, fairs, carnivals, play dates, several restaurants and many gatherings where he could be exposed to peanuts. Isaac does not get to enjoy the same things children of his age do and my heart breaks every time I have to tell him "No you can't go there" or "No you can't do that" while he watches his friends enjoy. Not only does my family want Isaac to have the opportunity to enjoy everyday activities but we want to ensure his safety in doing so. We have been methodical in ensuring his environment has been safe the last 4 years. Now Isaac is 4 years old and will be starting kindergarten in the fall of 2011. My husband and I are fearful for Isaac's safety in such an uncontrolled environment. There is no cure for a peanut allergy and the only treatment is to avoid the allergen. Reactions to exposure can range from hives to anaphylaxis and can happen immediately. My family is trying to ensure that Isaac not only have the same opportunities to enjoy everyday activities, but that he is safe in doing so. Isn't that a parents job? Fortunately we have been introduced to a new tool we can utilize to protect our son and allow him to begin to enjoy some of life's simple things like play dates, outings, family gatherings and school. Peanut Detector Dogs. These dogs are trained to detect peanut residue on objects and people. These service dogs can allow our child to begin to indulge in simple life situations with an added safeguard. Things such as family gatherings, school activities, classrooms and hugs! 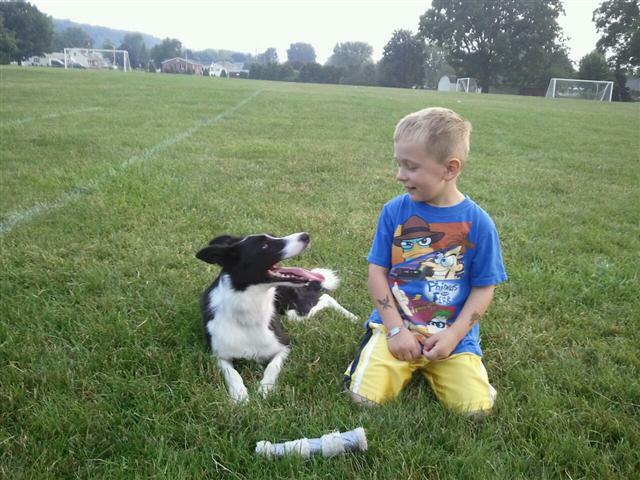 Walk On Foundation was happy to assist in raising the $10,000 needed to train and supply the dog for young Isaac. You can continue to watch updates Isaac's Peanut Dog Site.